Practice for perfection !! 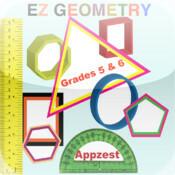 Appzest Presents Let us Practice Educational apps series – EZ Geometry Level 1 app for elementary and middle school. This app is designed with common core standards and best suited for Grade 5 and 6 senior elementary/middle school level students. It covers 32 various Geometry chapters and has over 1200 questions. Create your own user name (supports as many users as you wish) and take the practice tests. There is no Time constraint but a wrong answer has a score penalty. Provides a progress report for all completed chapters which can be emailed to Parents or as a copy to yourself. A cool Scratchpad replaces the need for a pen and a paper. Welcome to the new generation Educational Aid and practice your Geometry skills. Are you ready to get an A+ ? ?